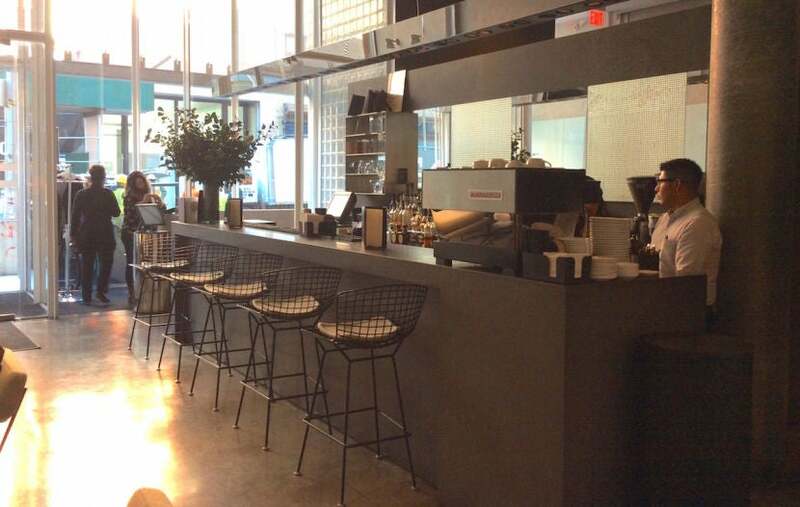 On a recent trip to New York City, TPG Special Contributor Eric Rosen had a chance to stay at one of Starwood’s latest member properties, Hotel Americano. Here’s his review. (All photos are by the author). Back in November, Starwood Preferred Guest added Design Hotels as the eleventh brand in its collection. While Design Hotels encompasses nearly 300 properties worldwide, not all of them would participate in Starwood Preferred Guest all at once. The roll-out will be gradual and as a result, SPG members will have to check and see whether a specific property is already participating before planning future stays. 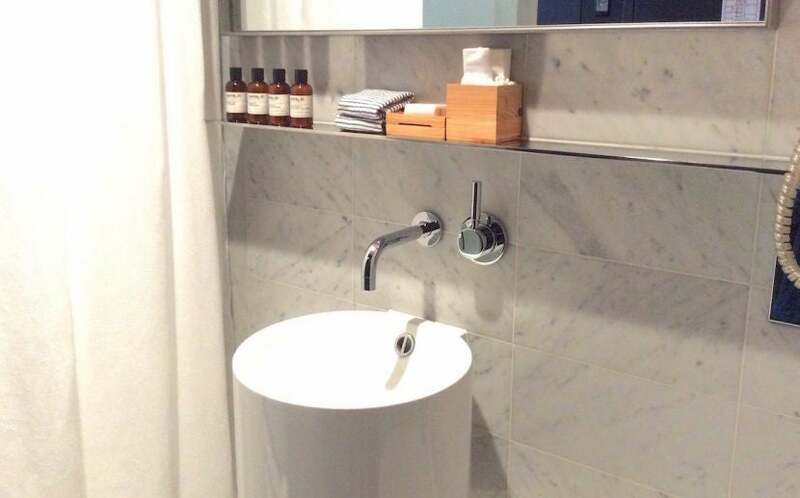 Luckily, on a recent visit to New York City, a Design Hotel property I was interested in, the Hotel Americano, was one of the hotels that was already part of the Starwood Preferred Guest program, so I went ahead and booked a stay there to check it out. Hotel Americano is a member of Design Hotels, and now, Starwood. I’d like to say I was on top of the Design Hotels integration into Starwood, but I didn’t find out about Hotel Americano participating in SPG until I opened up the SPG app on my iPhone to check hotel rates on the night I needed to spend in New York. Sure enough, along with other properties including Sheraton, W and Aloft (as well as The St. Regis New York and The Chatwal, A Luxury Collection Hotel, New York City), the Hotel Americano showed up as an option. 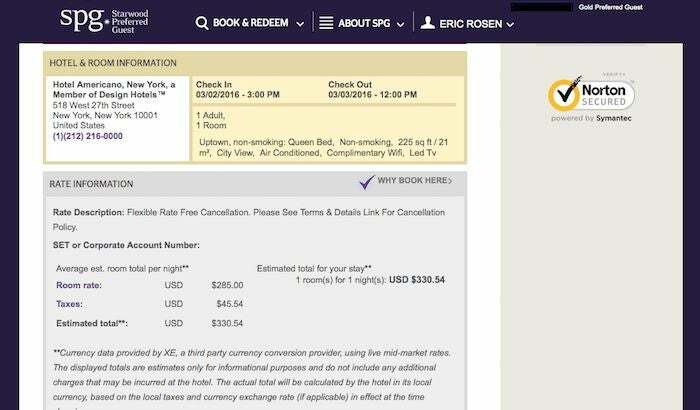 While paid rates were already available, points bookings were still not showing up at this point. 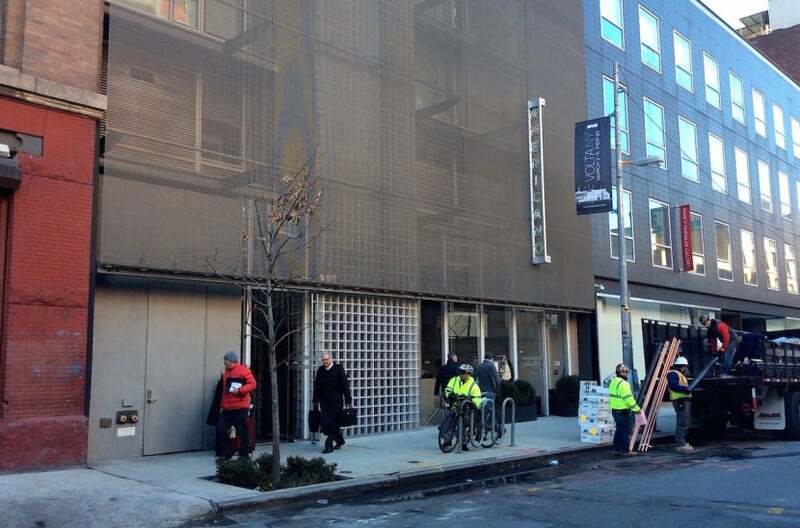 Hotel Americano popped up on Starwood’s website as one of the New York hotels I could book. I was planning on checking out a few different hotels during this trip to New York (which would be three days total), but ended up booking the Hotel Americano for the first night since the starting rate was $285 on each of the three nights I was considering. I booked a superior uptown non-smoking room with a Queen-sized bed, the cheapest option at the time, and the total came to about $331 including taxes and fees. Starting rates for various room types available on the night I wanted to book. As an SPG Gold elite member, I expected to earn to earn 570 points (at 2x points per dollar) plus an elite bonus of 285 points, a 250-point welcome bonus as well as an extra 250 points for the single night thanks to the SPG Take Two Promo for a total of 1,355 Starpoints. On top of that, I’d also earn 990 Citi ThankYou points thanks to the 3x travel bonus on my Citi Premier Card, which I used to pay for my stay. The final price for my stay. I was flying in from Abu Dhabi, so I arrived in New York at around 9:30am and got to the hotel about an hour later. Hotel Americano is located just west of 10th Avenue on 27th Street, a block from the High Line and close to lots of Chelsea’s famous art galleries. The property opened back in 2011 as part of a Mexican hotel group called Grupo Habita. It was designed by Mexican architect Enrique Norten, who basically overhauled a former parking garage into a 10-story hotel. The façade itself is somewhat understated but covered in an eye-catching bronze mesh sheath, which I thought was a cool statement piece. Just be aware of the construction site across the street if you get a front-facing room. I walked into the small lobby — which was really like a small sitting room with a coffee table and art books — and over to the reception desk. There’s also a restaurant in the back and a bar/café over to the side. I honestly didn’t expect my room to be ready and sure enough, it wasn’t. But the front desk checked me in anyway so the staff could take my bags up as soon as the room was good to go. I asked them to let housekeeping know I was already checked in so that they might prioritize cleaning my room if possible. At the very least, check-in time was 3:00pm, so I could always just get into my room then. 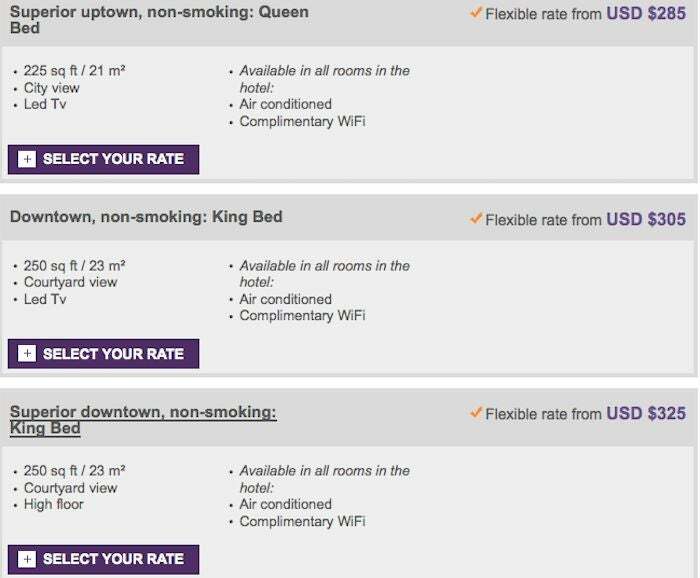 The good news was that I had been upgraded not one but two room categories to a superior downtown non-smoking king room, which normally goes for $40 more per night than the room I’d originally booked. I left my bags with the front desk and headed out to run a few errands. I got back to the hotel around 2:00pm and asked if my room might be ready yet. It still wasn’t, but they said I could return to my original room category if I wanted to get into a room right away — I said I would wait, but asked if they could maybe call housekeeping again to ask them to prioritize my room and they said they would. I told them I’d just be in the café working and was ready to go up at any time. Meanwhile, I walked to the other side of the ground level to the little bar and café area and set up my computer so I could get some work done. The staff there were great, constantly refilling my water and asking from time to time if I needed anything else. It was solicitous without being overbearing. The bar adjacent to the lobby, where I spent quite a bit of time. With no word on my room status for a while, I walked over to reception at 2:45pm and asked if there were any updates. The front desk staff called housekeeping and were told it would be another 15-20 minutes. I didn’t mind too much since I had work to do and 3:00pm is the regular check-in time, but I did wonder a bit why they still hadn’t been able to get to my room in all that time. I just needed to get into the room by 3:30pm or so in order to freshen up before a meeting, so once again I asked if they could try to speed things up since I’d arrived in the morning and they knew I was ready to get into the room immediately. The staff at the front desk were very nice and apologetic, offering me a free drink ticket for the bar. I got back to work in the café but at around 3:30pm, I realized yet another 45 minutes had passed. At this point, I walked back over to reception and asked what was going on. The man at the desk called housekeeping and sure enough, my room was ready, though they hadn’t called down to let us know. The front desk agent offered to bring my bag up, but I was cutting things short as it was so I asked him just to get it for me then and there so I could take it up with me and get changed for my meeting. 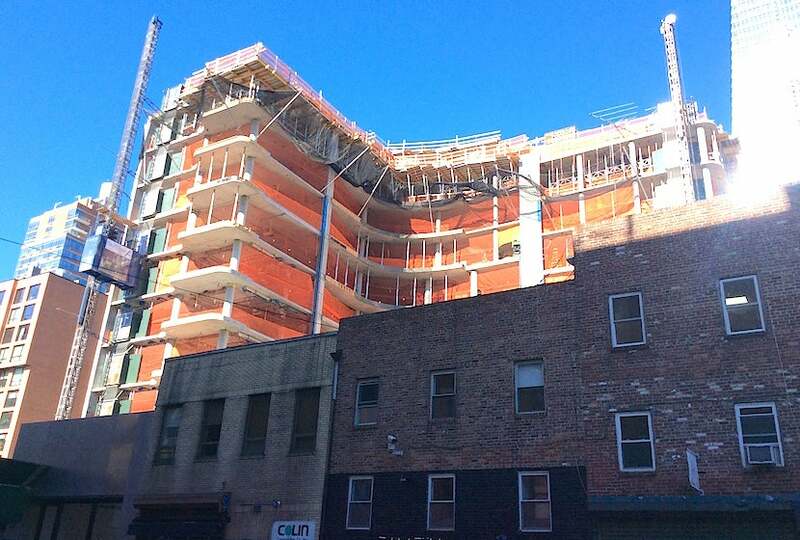 The hotel only has 56 rooms — mine faced the back of the building, which made it nice and a bit quieter than the front-facing rooms, since those looked across 27th Street to a huge construction site. My upgraded room also had a larger bed than the one I’d originally booked and was about 30 square feet larger overall. A panorama photo of the room. It was bright in there — a rarity for NYC hotels. The interiors were designed by Arnaud Montigny, whose aim was to create neutral but warm spaces, sort of like an “urban ryokan on the Hudson,” according to the hotel’s site. I definitely got that vibe since the room was quite minimalist. There was a small closet just inside the door and a sort of side-table glass desk with snacks and mini bar drinks on it along with a colorful stool to sit on. The bed was a single mattress in white linens on a slightly raised blond-wood platform, its back to the window — that was the part that invoked a ryokan style setting for me, though if you have trouble getting up or down to the floor, this might not be the hotel for you. Next to it was a hanging globe lamp, while there was a small flat-screen television on the opposite wall. The white-marble bathroom was fairly tiny, even by New York City standards. It had just a single sink and no counter space — well, there was a very narrow ledge above the sink, but not enough to put on anything besides some toothpaste and a toothbrush. 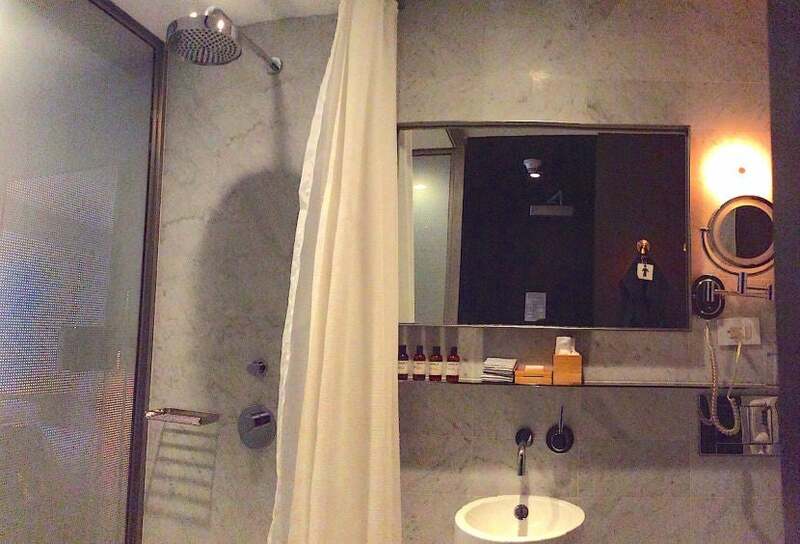 The shower had hand-held and overhead shower heads, and was stocked with nice Le Labo products, just like the Park Hyatt Tokyo offers. The towels were Turkish while the bathrobe was soft-washed denim. There were felt wool slippers available to wear in the room as well. The bathroom was small and there was no counter space! Every room comes with an iPad, but mine wouldn’t charge past 10% and was non-responsive so I didn’t get the chance to play around with it, though I saw it offered city guides and that you could use it to order room service. The hotel offers Wi-Fi for free, which was fast and worked well, so I just used my own electronic devices. The other interesting feature is that there were old-fashioned phones in the room — two, to be exact, because you couldn’t carry the handset with you. Granted, everyone uses their own mobile phones these days, but I actually was without my own phone for the night and had to make several calls, so I was sort of stuck like a teenager of yore pulling the phone as far as the cord would stretch so I could try to lie on the bed and talk. Oh well, that was kind of fun. 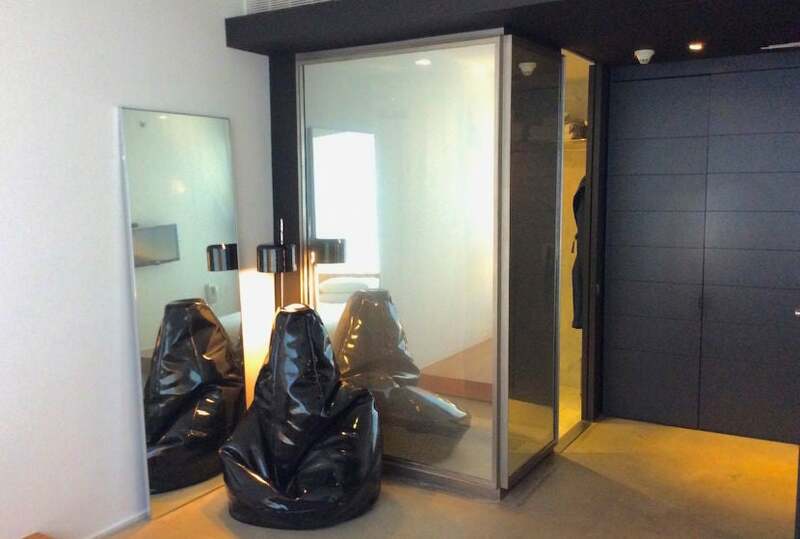 The other main piece of furniture in the room was what can only be described as a gimp-like black vinyl beanbag-style chair. It was half-sinister and half-ridiculous, but at least it was something to talk about! The vinyl bean bag chair in the corner of my room. Before I get too down on the hotel, let me just say there were a few things I really liked. It was cold out so I didn’t get to take advantage of this, but they do offer guests complimentary bikes to explore nearby Hudson River Park. They also offered maps of the area so you can explore its boutiques and galleries. The hotel’s main restaurant, The Americano, was located behind the lobby. It’s an open, airy space with marble tables, black banquettes and bright yellow chairs as well as a very cool mid-century overhead chandelier. The restaurant is open for breakfast, lunch and dinner, with a limited menu in the afternoon between lunch and dinner. 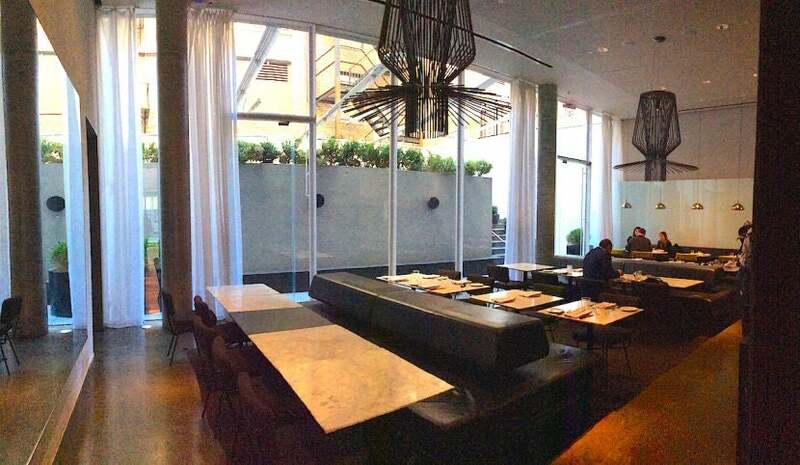 A shot of the hotel’s main restaurant before dinner service began. The menu is Latin-Mediterranean fusion, featuring dishes like tuna crudo with avocado, crème fraiche and aguachile; swordfish tacos with salsa roja; poulet fermier with young vegetables and pureed potatoes; steak au poivre with green peppercorn sauce and fries; and tarte tatin for dessert. Unfortunately, I had events going on in all evening so I didn’t get a chance to dine there this time around. Another shot of the restaurant. The hotel also has a small rooftop pool, which they turn into a tented tapas-and-tequila restaurant called Arriba during the winter. I had a few plans that evening, but managed to pop up there for a quick look around. There was a small bar on either side of the space — one with a leg of jamón on it — and a lot of low tables. It seemed really convivial and laid back. I did step out onto the terrace for a moment, too, to admire the skyline. There is also a private subterranean bar with its own entrance called Bar Americano, which serves a menu of signature cocktails as well as shots from the hotel’s Mezcal collection. 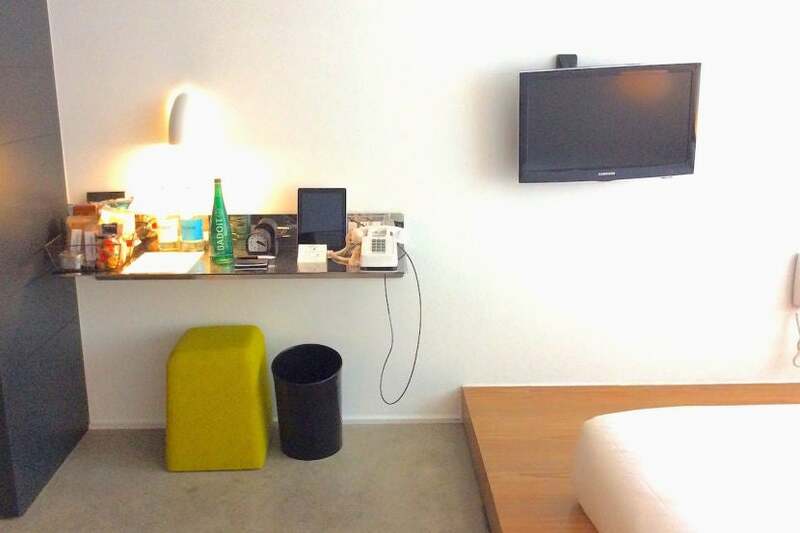 I know I must seem like a curmudgeon – I book a design-driven hotel and then complain about things like mattresses on the floor and old-fashioned telephones. But I did really like my stay here. I don’t know that it was worth the rate I paid, but there were a few ways I thought the hotel really stood out. First, it was a unique, singular property, which made it all the more special to be able to book through Starwood and enjoy my elite benefits there. In a city as saturated with hotels as New York, this one managed to stand out, which I really appreciated. I also thought it did a great job of being a sort of entrée into the Chelsea neighborhood and setting a tone for the visit. The public spaces were really cool and the staff working the bars and restaurants were great. I just was a bit disappointed by the check-in rigmarole and thought it could have been handled better. The bell staff were mostly absent, which I thought was a bit strange. However, when I needed a taxi, one of them ran out to 10th Avenue, hailed a cab and brought it back to the hotel for me, which was really great. Overall, I’d book the hotel again, though perhaps next time I’d hold out for a better rate and not try not to arrive in the morning! Have you booked a stay at a Design Hotel property through Starwood? How was your experience?